IA 10th On the basis of qualifying Exam. ISc 10th On the basis of qualifying Exam. Hindi 10+2/Inter with 45% marks in the concerned subject. On the basis of qualifying Exam. Botany 10+2/Inter with PCB and minimum 45% marks in concerned subject. On the basis of qualifying Exam. BCA Minimum 45% marks in 10+2/I.A./I.Sc. with Math as one of the subjects. On the basis of Entrance Test. Biotechnology Minimum 45% marks in 10+2/I.Sc. with PCM/PCB. On the basis of Entrance Test. Functional Hindi 10+2/I.A./I.Sc. On the basis of Marks in qualifying Exam. Recognition Process is underway and likely to start soon. T.N.B. 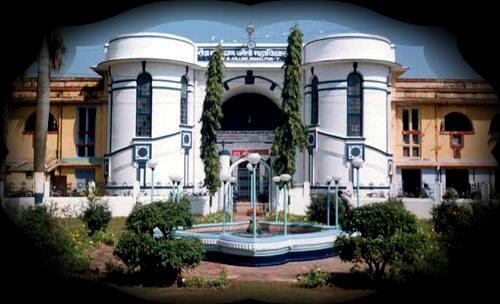 College is the second oldest institution of higher learning in Bihar, second to Patna College of Patna only. This College is now 124(one hundred and twenty four) years old having already celebrated its centenary in which the chief guest was the then Chief Minister of Bihar, Hon’ble Shri Bhagwat Jha ‘Azad’. It was established on 12 Feb. 1883 with Intermediate level classes then called as F. A. under Calcutta University, as there was no university in Bihar. Rai Bahadur Tej Narayan Singh contributed a good deal of his mind, labour, money and land also for its building and the college was named as Tej Narayan Jubillee College (TNJ). Just after 2 years in 1885, degree and Post-graduate classes in some of the subject of Arts and degree class in Law were started in this college. Again the successors of Banaili families came to its help and contributed 60 acres of land and 6 lakhs of rupees in Cash for the construction of building and other developmental work. The Govt. of Bihar also gave some grant for the building and as a consequence the magnificent building of the college came up in 1922. The college was renamed on the 23rd June 1959 as Tej Narayan Banaili College considering the great contribution made by the Banaili estate towards its rise and glorious achievements. In the year 1959 it was made a constituent unit of Bihar University and 12th July’1960, Bhagalpur University was established after bifurcation from the Bihar University and TNB College became the first premier constituent College of the University. In fact most of the present P. G. departments of Bhagalpur University, originated first in the T.N.B.College and then after a few years, got transferred to their present buildings. In Feb.’2004, the college was accredited by NAAC and awarded B+ grade. A big library building, Physics department block, students’ common Room, a big stadium for games & sports were constructed from the UGC fund and state Govt. funds. The library of the college has more than 86,000(Eighty Six thousand) books and journals. There are many societies and academic associations functioning, almost in all the department. T.N.B. College has had a glorious past 124 (One hundred & twenty four) years and a very high academic culture. Persons of great eminence have been students and teachers of this college. Some names may be proudly mentioned. The immortal novelist Sri Sarat Chandra Chattopadhyaya, National Professor of Physics, Sri S.K. Mitra, Messrs. K.P. Basu (great Algebra-man), L.K. Jha, Dr. S.C. Jha (Member, Economic Advisory Council to the Prime-Minister, Govt. of India), Sri A. K. Choudhary (I.A.S., Presently Chief Secretary, Govt. of Bihar) and many others whose names could not possible to be mentioned here are all glorified personalities connected with this institution. Hari Prasanna Mukherjee (1887 – 1905). Narendra Nath Ray (1905 – 1922). Shaileshwar Sen (1922 – 1930). Ram Prasad Khosla (1930 – 1934). Hari Chand Shastri (1934 – 1939). Har Lal Das Gupta (1939 – 1945). Ghosto Hari Sinha (1945 – 1948). Late Neelmoni Acharya (1948 – 1949). Dr. Janardan Mishra (Aug. 1949 – May 1957). Priya Bandhu Gupta (June 1957 – May 1959). Maheshwari Prasad (June 1959 – May 1961). Abdul Ahad (June 1961 – Jan 1962). Dr. S. Pd. Sinha (Jan 1962 – April 1976). Late Sadaruddin Ahmad (May 1976 – May 1976). Late Surendra Nath Jha (May 1976 – July 1977). Dr. B. N. Mukherjee (July 1977 – Sept. 1978). Late Surendra Nath Jha (Sept. 1978 – Dec. 1981). Dr. Amar Nath Prasad (Jan. 1982 – June 1982). Dr. Ganga Dutt Jha (July 1982 – Dec. 1987). Dr. Ayodhya Pd. Sah (Jan. 1988 – Aug 1989). Dr. N. Prasad Singh (Sep. 1989 – March 1990). Dr. Ayodhya Pd. Sah (Jan. 1990 – Feb. 1991). Dr. K. Pada Banerjee (March 1991 – Oct. 1991). Dr. R. K. Choudhary (Nov. 1991 – Dec. 1991). Dr. Narayan Pd. Singh (Dec. 1991 – Sept. 1993). Dr. C. P. N. Sinha (Sept. 1993 – Jan. 1996). Dr. R. P. C. Verma (Jan. 1996 – June 1998). Dr. Janardan Sharma (June 1998 – July 2001). Prof. Anil Kumar (July 2001 – July 2002). Prof. N. K. Yadav “Indu” (July 2002 – Dec. 2002). Prof. J. Choudhary (Dec. 2002 – Feb. 2003). Prof. R. P. C. Verma (Feb. 2003 – July 2004). Dr. Ram Dayal Singh (July 2004 – July 2004). Dr. Gopal Pd. Yadav (July 2004 – June 2006). Being the premier institutions of higher learning, T.N.B. College is a well-known centre of excellence. In between the capital cities-Kolkata and Patna, TNB College, has been the only institution for quality higher education. It is the mother institution for inception of all the P.G. Deptt. Of Bhagalpur University. The College imparts teaching in almost all the popular subjects in the faculty of Art and Science numbering 19. Some more interdisciplinary subjects have been introduced recently. Vocational and Self-financing courses like B.C.A., Biotechnology and Functional Hindi are also running. Extra curricular activities like games, sports, fine arts, music, and drama are the part of curriculum and regular features. NCC, NSS and extention Services are the integral part of college-life. The college for the upliftment of academically poor students conducts remedial courses. The college runs from 7.30 A. M. to 4.40 P.M. daily. Prescribed dress code for boys and girls is in vogue. Regular and 75% attendance is compulsory which is strictly maintained. Much emphasis is laid on laboratory work, field trip and excursion, social services through various activities and programmes like literacy campaign, blood donation, child immunization Programme, AIDS awareness, eye camp, communal harmony and all round development of the personality of students. Previously, the college was a residential one, but with the increase in the number of students, it serves only 10% of the students with accommodation facility. The hostels of the College are located in the campus forming as integral of it. The recruitment of teachers is done through University service commission at the state level. Teachers of the college are well qualified, dedicated, disciplined and punctual. They are oriented towards teaching and research. The teachers-students relationship is much cordial. The College campus is free from unrest. The examination system is fair and transparent. The students are enrolled on the basis of marks. There are about 6000(six thousand) students on its roll. The courses of studies are in conformity with national standard based on UGC model curriculum. Seminars, Symposium, Conference, interaction, Project-work are common features of the institution. The college is reputed for quality teaching, fair examination and in every sphere, it ranks on the top as a model institution. The College tries its best to inculcate among the students the fine human values for enlightment of not only their personality but also their contributions towards the society and the nation at large. The reservation policy of the govt. in admission is strictly followed. The employees of the college are assessed through C.R’s. The College management is administered solely by the rules and regulations of the University, State Govt. and UGC. Teaching is done by different methods i.e. lecture method, demonstration method, audio-visual methods. Classroom teaching is given top most priority. Students devote maximum time in Practical & Project work. Learning is based on classroom teaching library and other experiences. Students learn so many things and develop their skills through various academic pursuits. The evaluation of both the teachers and students is monitored in order to maintain high standard of education. A Constituent Unit Of Tilka Manjhi Bhagalpur University, celebrating 129 years of service.